5520 ✉ 309/13 Peoples help 1951 complete on five beautiful and very decorative maximum cards in perfect condition. From this set are very few maximum cards have become known. As complete set almost never offered! Photo expertize Ney. 5521 Fheetlet 358 15 Fr. Rotary flight 1955, Artist block in blackish reddish brown on hand made paper, size 132:169 mm, fresh colors and in perfect condition. Very small edition! 5522 Fheetlet 358 15 Fr. Rotary-Club 1955, Artist block in reddish brown on hand made paper, size 128:169 mm, fresh colors and in perfect condition. Very small edition! 5523 358Probe 15 Fr. Rotary 1955, unperforated proof in black, single copy (size 6, 5:7, 6 cm), in perfect condition mint never hinged extraordinarily rare! 5524 358Probe 15 Fr. 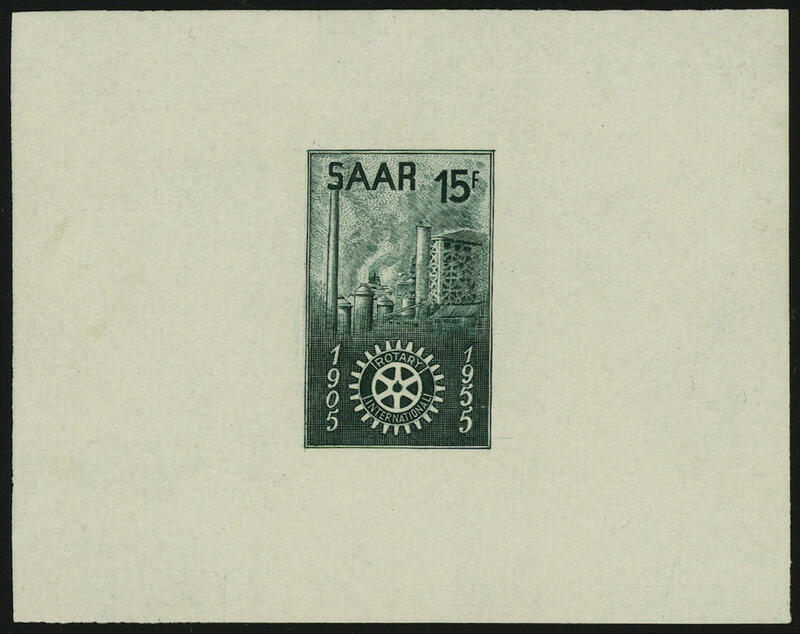 Rotary 1955, unperforated proof in green, size 9, 3:7, 4 mm, in perfect condition mint never hinged extremely rare! 5525 358Probe 15 Fr. 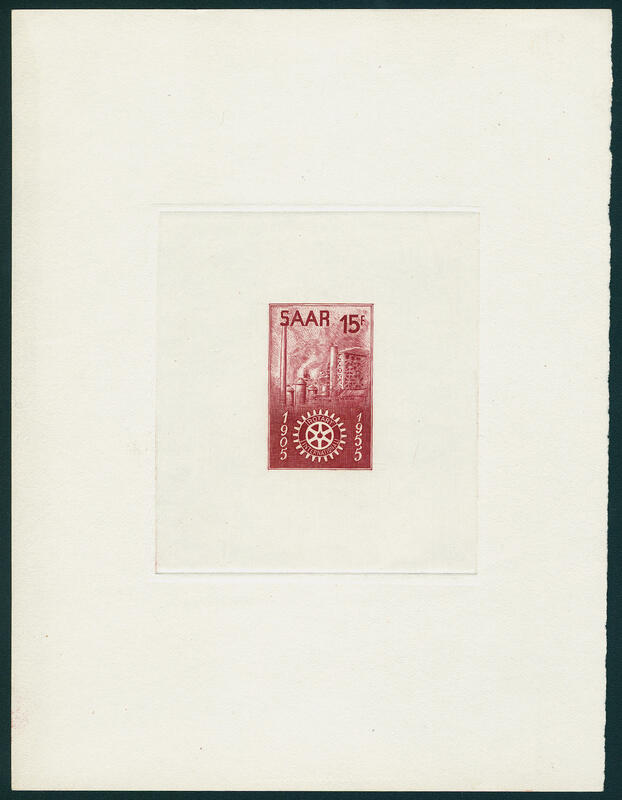 Rotary 1955, unperforated proof in red-brown, size 9, 1:7, 3 cm, in perfect condition mint never hinged extremely rare! 5526 358Probe 15 Fr. 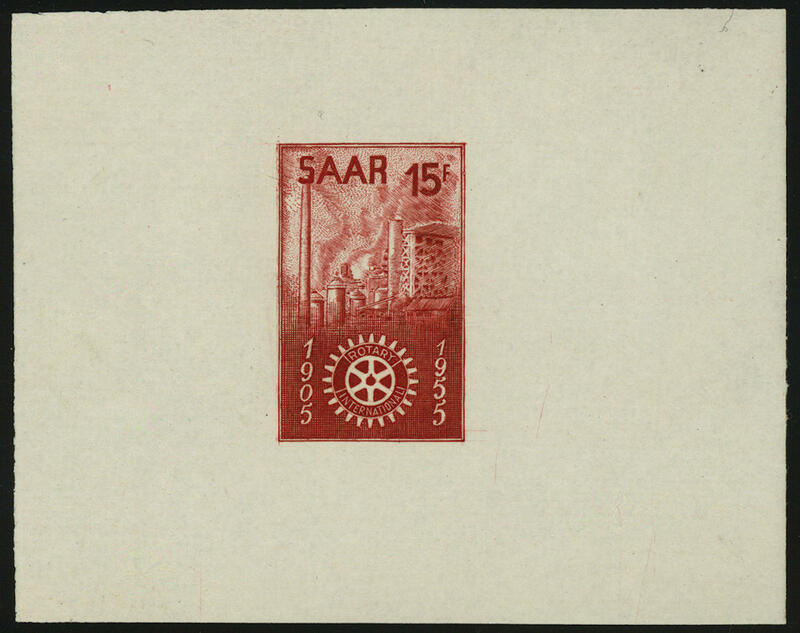 Rotary 1955, unperforated proof in brownish orange, size 9, 3:7, 4 cm in perfect condition mint never hinged extremely rare! 5527 371PU 12 Fr. 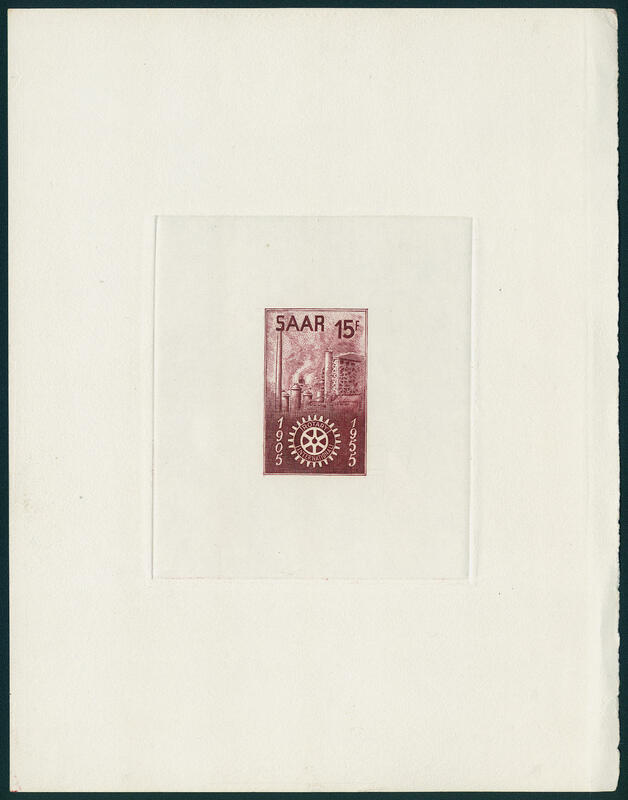 Olympic games 1956, horizontal proof strip of five in different colours unperforated with on both sides margin, in perfect condition mint never hinged extraordinarily rare and a Honor for the advanced Saar and olympic games special collection! Photo expertize \"the quality is perfect\" Geigle BPP. 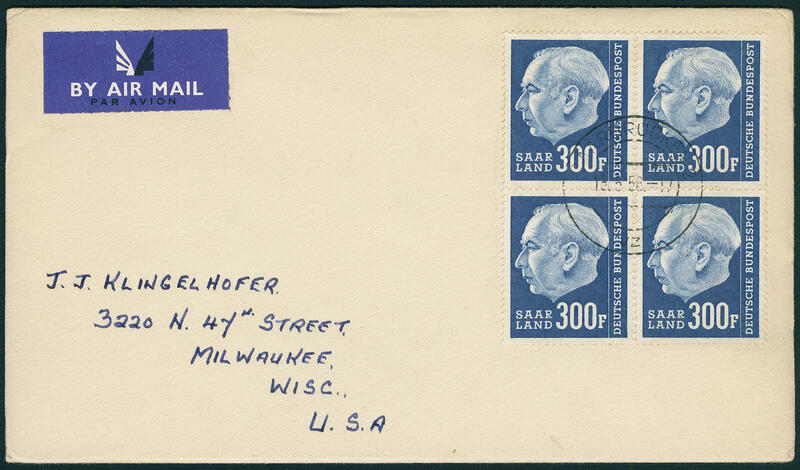 5528 376/78Probe Peoples help 1956, all three values as unperforated trial proofs in different colours from left margin of sheet, in perfect condition mint never hinged, expertized Dr. Schneider. 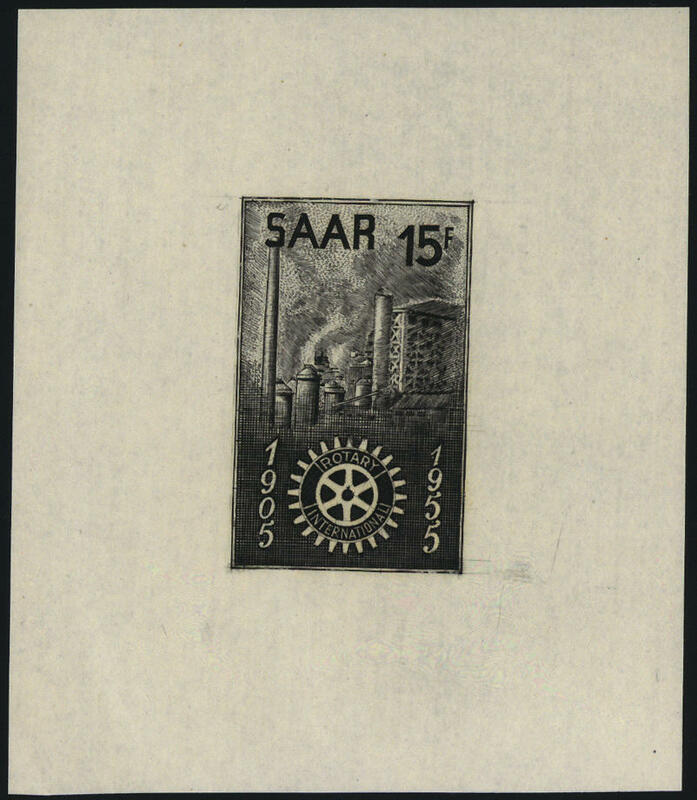 5529 ✉ 409/28 Heuss with indication of currency, wonderful block of four set on 20 covers, all with centered two ring cancel \"SAARBRÜCKEN 15.5.58. \", addressed to the United States, without arrival postmark. Block of four sets are already lots used extraordinarily rare. In this kind especially decorative! 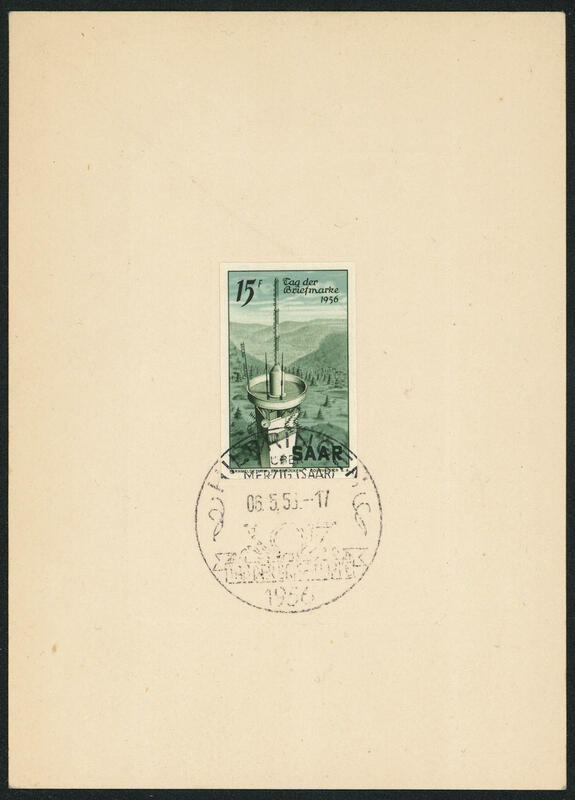 5546 ✉ Dutch army postal service the plebiscite troops, 12 ½ C. Blue, fresh colors and in perfect condition on decorative, commercially used fieldpost letter with two ring cancel \"HOORN 28. XII. 19. 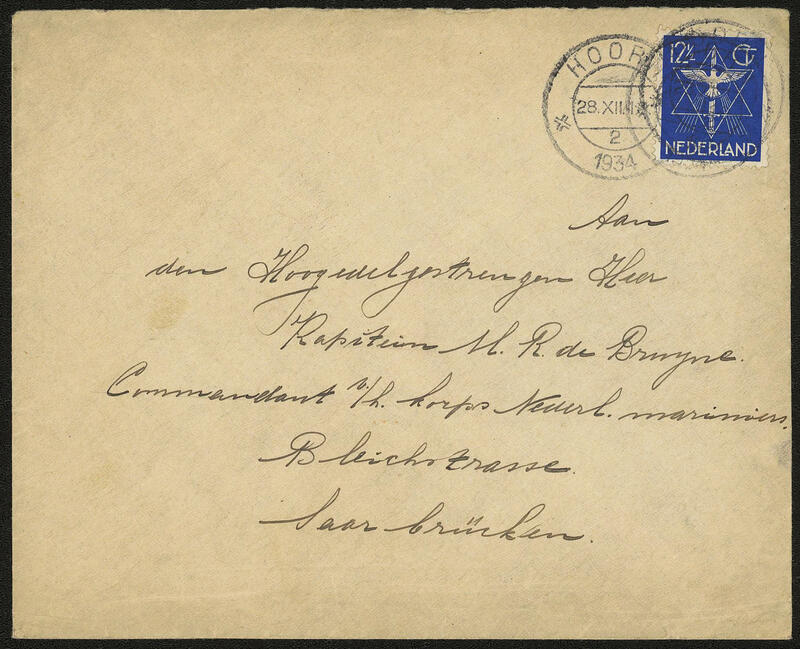 \" to a Commanders the Dutch plebiscite troops in Saarbrücken. 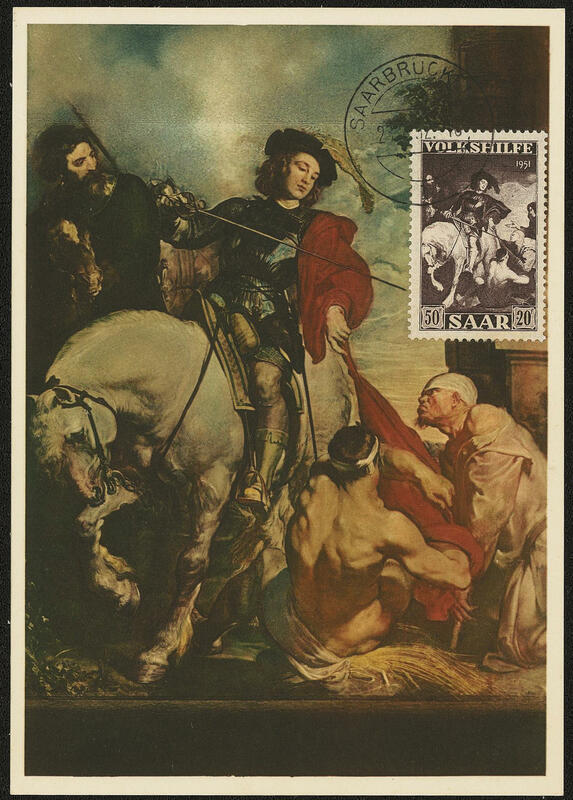 Already army postal service of the Saar in Holland is very rare. 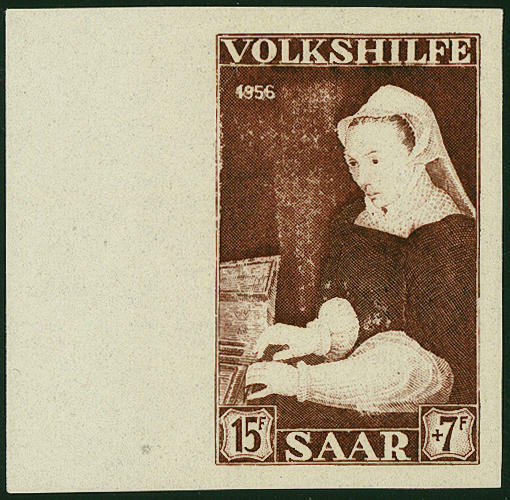 Incoming mail from the Netherlands in that Saar region counts to the all large rarities and is also in the Michel special catalogue due to missing offers only noted without price! Photo expertize Hoffmann BPP. 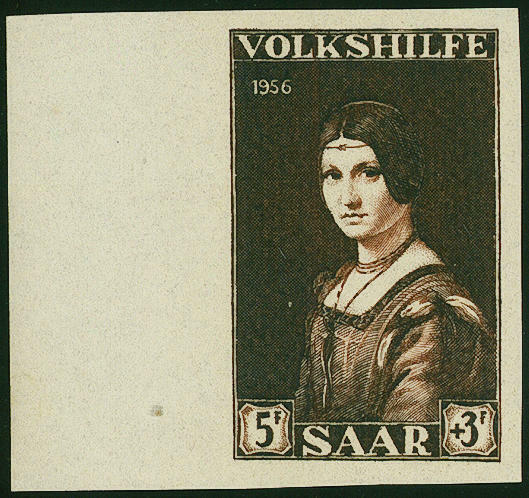 5532 Fheetlet 351 5 Fr. 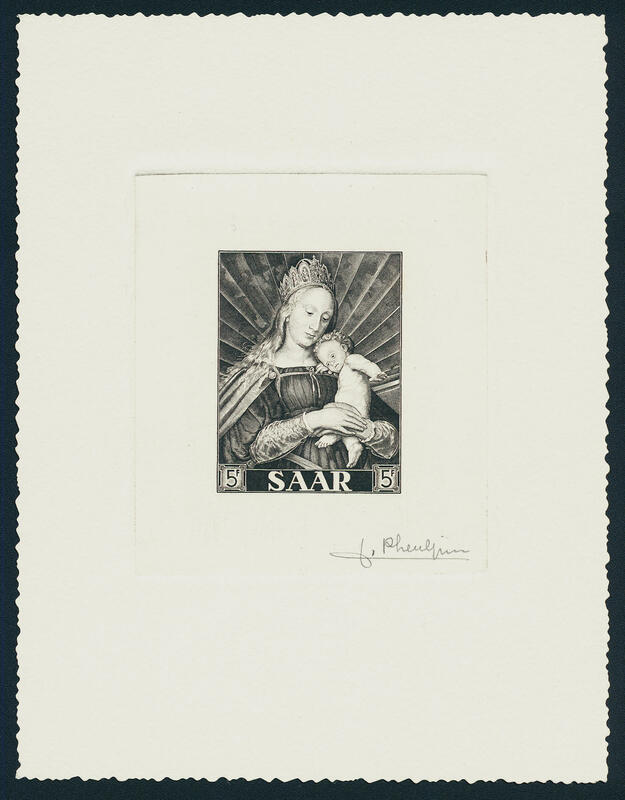 Madonna 1954, faultless Artist block in black on hand made paper with signatur Pheulpin. A Saar rarity with tiny edition! 5533 369M 15 Fr. 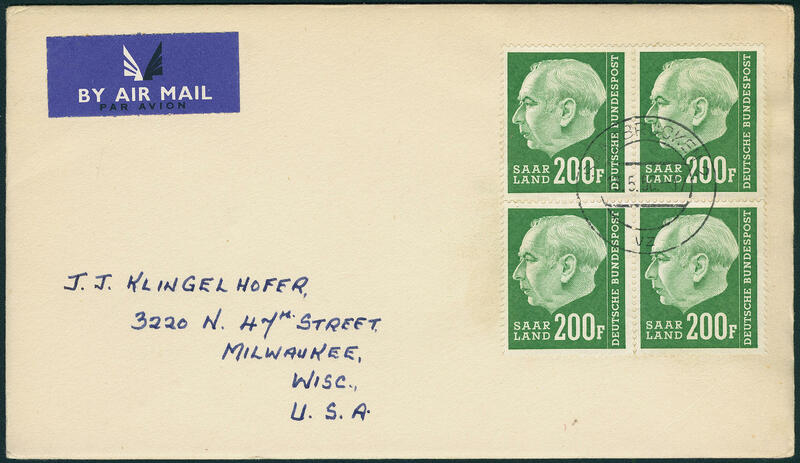 Day of the Postage Stamp 1956, faultless Secretary of State souvenir sheet with special cancellation \"HILBRINGEN Day of the Postage Stamp 6.5.56\", fresh colors in perfect condition. 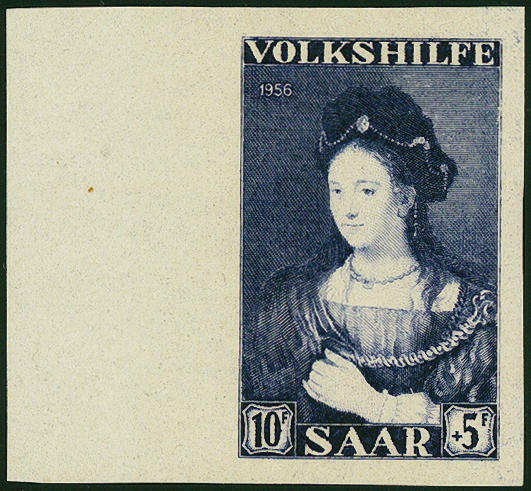 The Secretary of State souvenir sheets samples official not postally valid, there are only few used examples have become known, the to the large rarities of the Saar country count! Photo expertize Ney. 5534 Fheetlet 371 12 Fr. 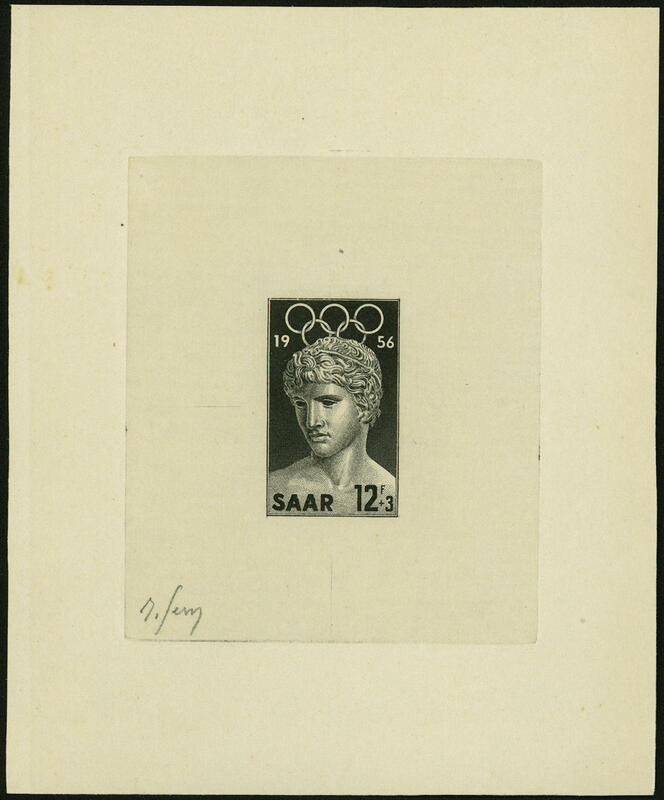 Olympic games 1956, faultless Artist block in blue black with signatur of the artist \"SERRES\", extraordinarily rare! 5535 Fheetlet 371 12 Fr. 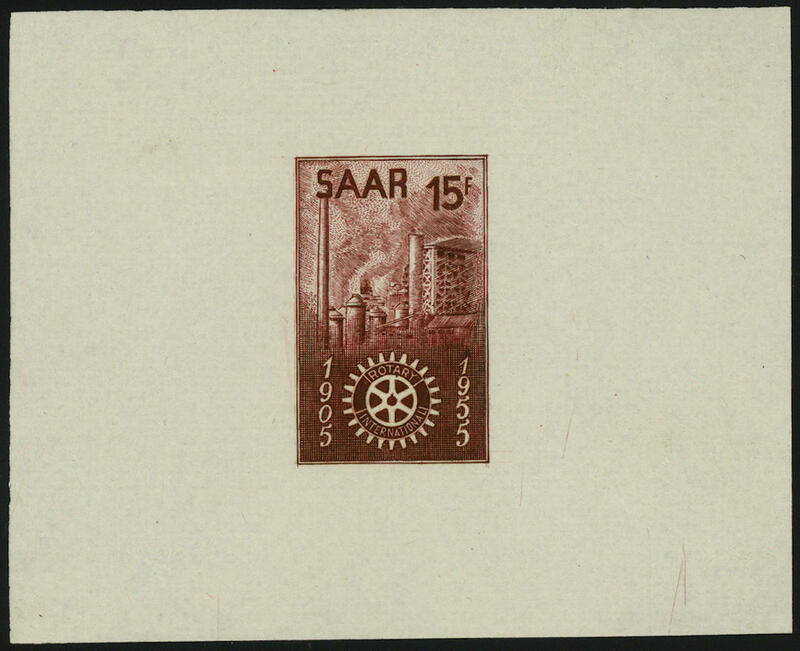 Olympic games 1956, faultless Artist block in brownish orange with signatur of the artist \"SERRES\", extraordinarily rare! 5536 Fheetlet 371 12 Fr. Olympic games 1956, faultless Artist block in green with signatur of the artist \"SERRES\", extraordinarily rare! 5537 Fheetlet 371 12 Fr. 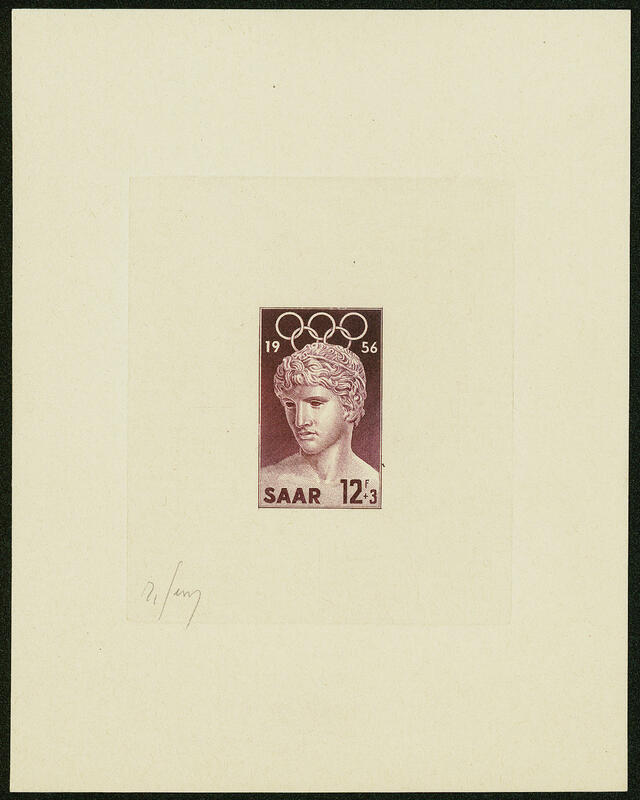 Olympic games 1956, faultless Artist block in blackish violet with signatur of the artist \"SERRES\", extraordinarily rare! 5538 Fheetlet 371 12 Fr. Olympic games 1956, faultless Secretary of State souvenir sheet on hand made paper. 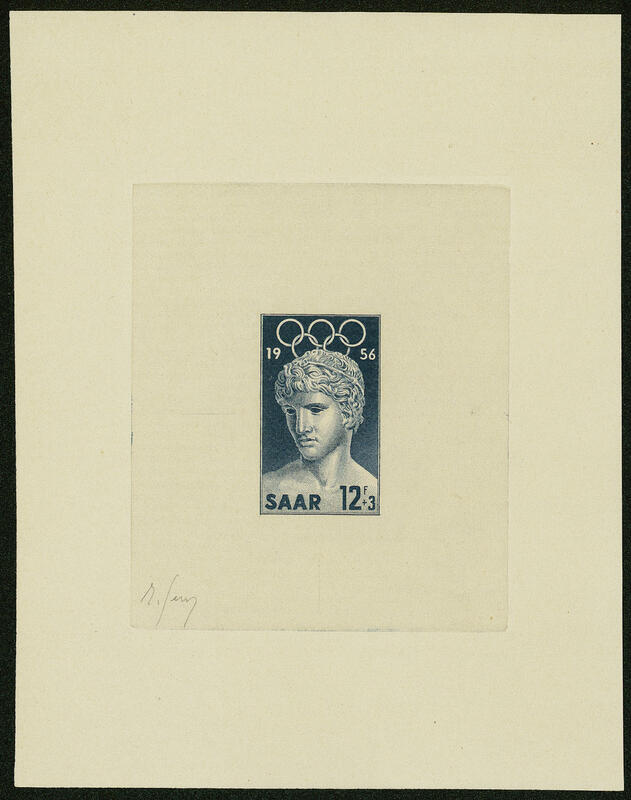 It were very few examples produced, a large Saar and olympic games rarity! 5539 Fheetlet 371 12 Fr. 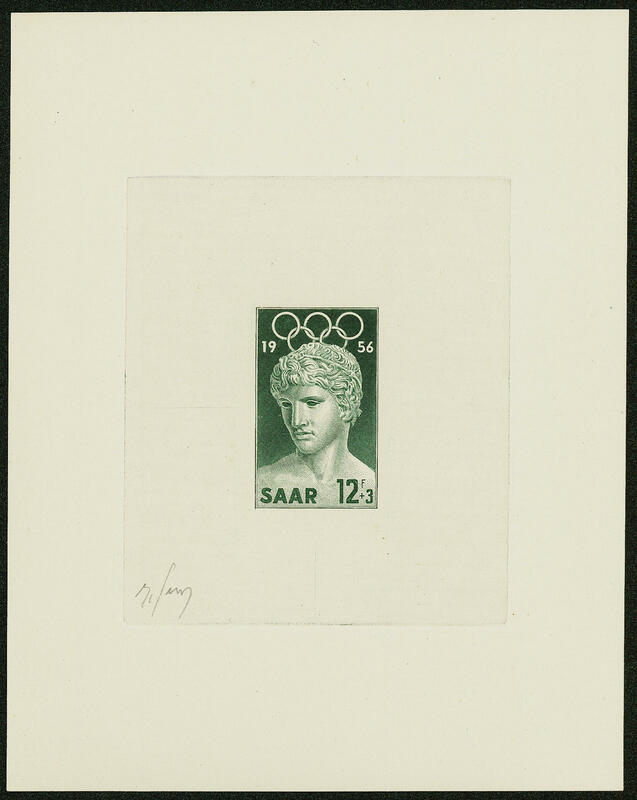 Olympic games 1956, faultless Artist block with original signature of the designer Serres. It were very few examples produced. 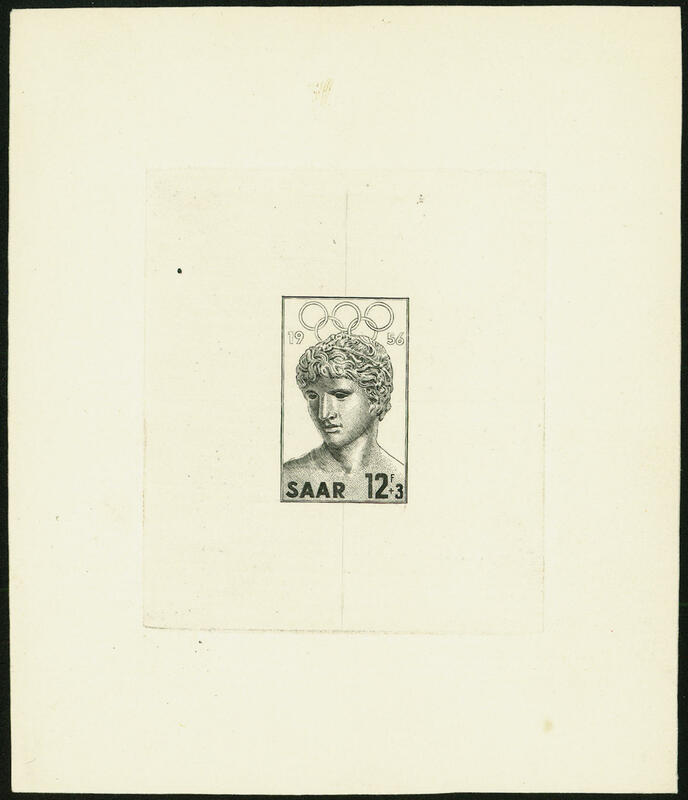 A significant Saar and olympic games rarity! 5540 Fheetlet 372 15 Fr. 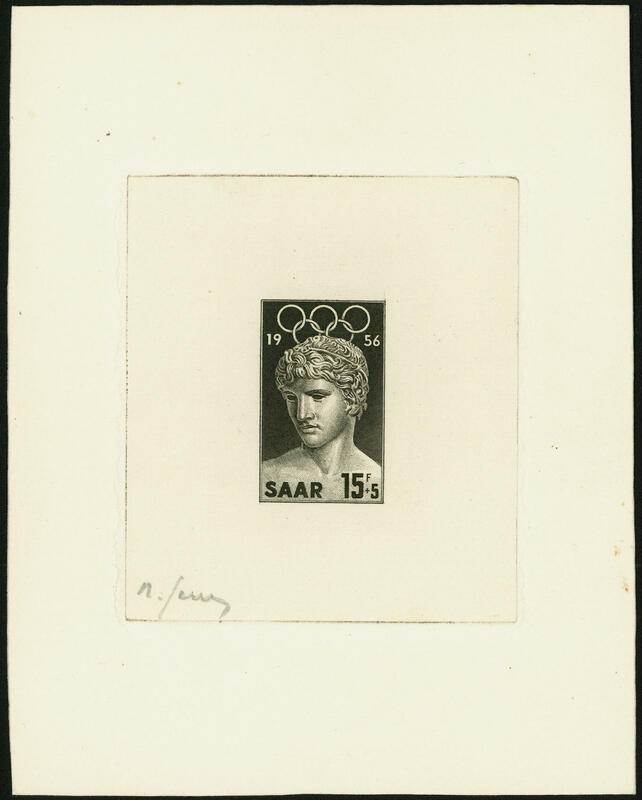 Olympic games 1956, extremely rare Artist block with signatur \"SERRES\" on hand made paper. There are very few examples from this known. 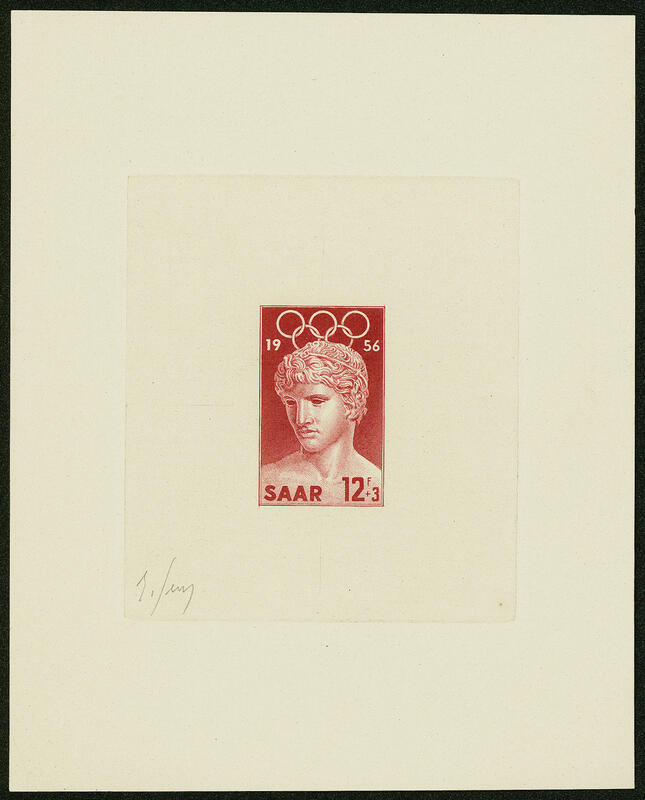 A rarity for the Saar respectively olympic games special collection!